This new version of Amazming’s excellent fan edit presents Joel Schumacher’s 2004 film resynched to the original London cast recording of the musical looking like an old film print from the 1920s. A very different looking version of Amazming’s excellent fan edit. This new version still presents Joel Schumacher’s 2004 film resynched to the original London cast recording of the musical (feat. Sarah Brightman and Michael Crawford), but the whole film has been altered to look like an old film print from the 1920s. 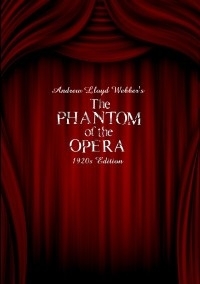 An homage to both the 1925 film version with Lon Chaney and to the original cast of Sir Lloyd Webber’s muscial, this “1920s Edition” is presented with two separate audio tracks : One featuring a remastered version of the original London cast recording in pristine quality, and one featuring that same recording in a vintage sounding “old and damaged” quality, fitting the look of this 1920s edition of The Phantom Of The Opera. Many thanks and much credits to Amazming, for his original Phantom Resynched fan edit which this edit is based on! 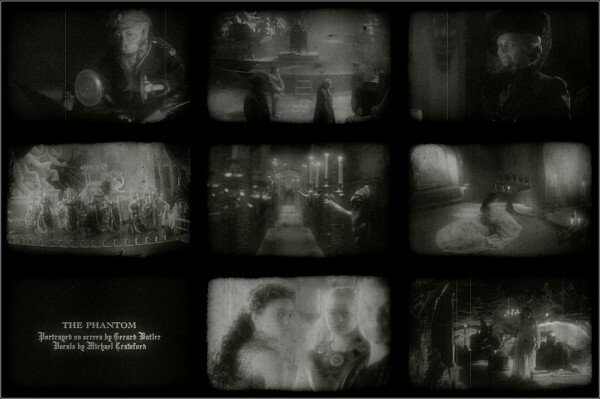 The original Fan Edit “Phantom Of The Opera Resynched” created by Amazming. 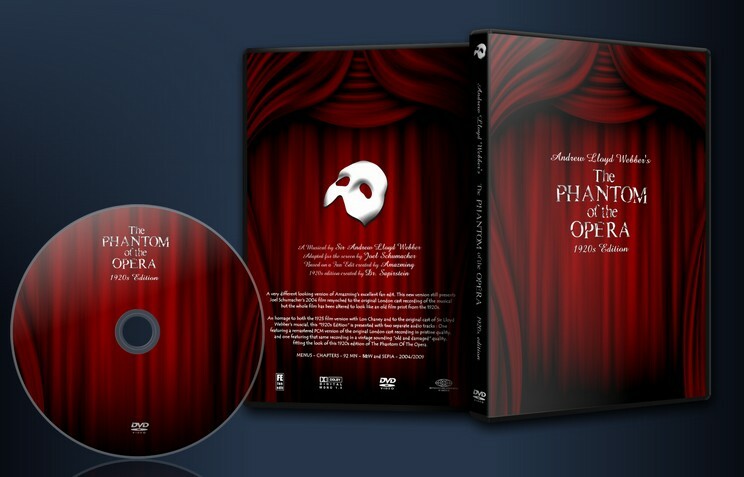 The 2CD set of the original London cast recording for uncompressed sound quality. Original damaged 8mm home movies reels used to create the vintage filters. The film has been reframed from its original 2.35 ratio to a more “old school” 1.33 full frame ratio. The whole film has been altered to look like a damaged film copy from the 1920s. Added inserts : Vintage start and end credits, Intermezzo card between Act 1 and Act 2. Score one for sheer chutzpah. Seize Lloyd Webber’s bloated version of his wildly popular musical, trim the fat (almost all dialogue) and sideplots, decolour it so it resembles a 1920s Silent film. Unfortunately, he goes one step further and applies heavy damage effects to the entire print. Video - 672 X 512p. Black n white. Frame is resized from 2.35:1 to 1.33:1. Damage effects applied across the board with this one. Scratches, artifacts, image fading. Luckily there are no sprocket holes or celluloid burn through, although that would not have surprised me. The image stutters now and then, another old-timey effect. None of these are done with a light hand. Everything seems pushed to 11. Audio - AC3 640 kbps Mono AND Stereo. Yes, two separate audio tracks. Mono and Stereo. No subs. The syncing of the edited film with the London Cast recording is exceptional. I listened to the stereo on headphones; that was easier for me than the mono. Now and then I heard what sounded like clipping in the right channel. Narrative - Surprisingly, with 49 minutes cut, the plot holds together well. Love him or hate him, Lloyd Webber was on creative fire at this juncture, and Phantom is blessed with memorable hooks. The music propels the story. Plus, the tale is folklore. Even with zero dialogue, the average viewer can follow this. Enjoyment - I stayed with this, though the damaging effects grew distracting. At odd points the image washed out completely. For a 1920s print, this would be in atrocious condition. I have viewed a couple hundred films from the 20s: grand classics, star vehicles, obscuro cinema. Few looked as terrible as this. Had this been circa 1915 one might have been more forgiving. Dating earlier, say 1895, using Latham equipment, would have been better. This is an inspired concept. Source material is top notch. The film itself, while fattened heavier than turkey dinner, is sumptuous looking with rich colours. Even rendered black n white. there are a luxurious amount of textures and contrasts. All, unfortunately, obliterated in this edit. Do I recommend this? Absolutely! Even a grand miscalculation, as this edit strikes me, is a potential learning experience. Any editor looking to craft grindhouse, old fashioned, or vintage, should study this. Realize the difference between restraint and excess.